First things first, a little back story and a before picture. As many of you know by now, I have this little 1970's river rock fireplace situation going on in my living room. And by 'little', I mean it dominates the whole room. While there have been times that I've thought about painting it or redoing it with something more current, at the end of the day, I guess I've kinda grown to love the little fella. Plus, the more I thought about it, the more I realized that I could work with what I had. Feel free to feast your eyes on my first attempt at stacking logs. So, after a lot of work and craftiness, here is my fireplace today. I barely even have the words to explain what's going on, because I'm too excited. You guys know I usually just roll around in paint and feel like I'm McGyver, so pulling something off of this magnitude is totally new territory. Can we just crawl inside the logs for a minute and sit down and talk woman to woman? Anyways, I absolutely love the way it turned out, and I love the way it looks with the rest of the changes I made to the living room last week. I've redone most of our living room using thrift store finds, (You can see the rest of the living room reveal from last week here.) and the fireplace area is no exception. WHO are these people who expect me to fork over $400 for a mantel? Uh uh. I will NOT. So, instead Jesse built one for about $20-$30. It ended up being pretty easy to build our own, and I'll share the full mantel tutorial very soon. But seriously, didn't Jesse do such a great job? 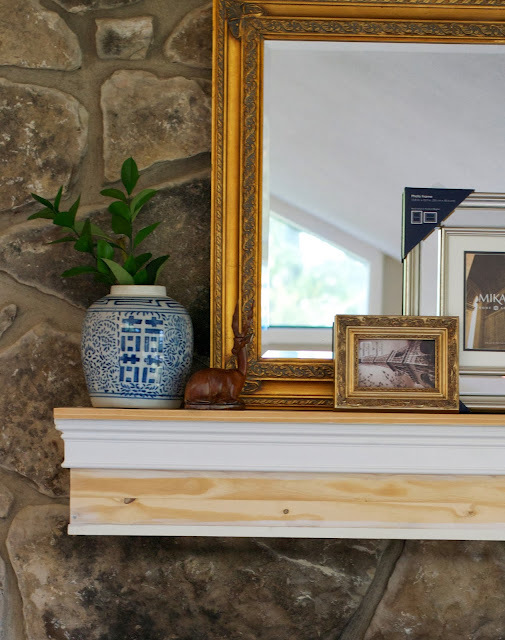 Update: See the mantel tutorial here. So, let's break down the styling details on the mantel. Like I said, most of them are thrift store finds. Ya'll know I'm still trying to figure out this decorating thing, so my first time EVER IN LIFE styling a mantel was kinda rough. It took me about 10 tries to make it work. And when I say 10, I mean 72. 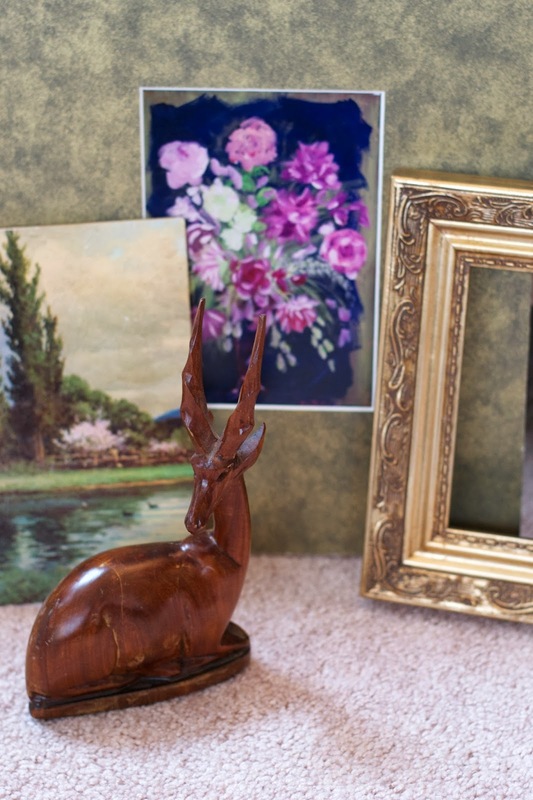 You may have witnessed my excitement on Instagram when I found this little deer/antelope/whatever-it-is wooden carving for a dollar. I also found that little ornate gold frame and a few bits of random art. 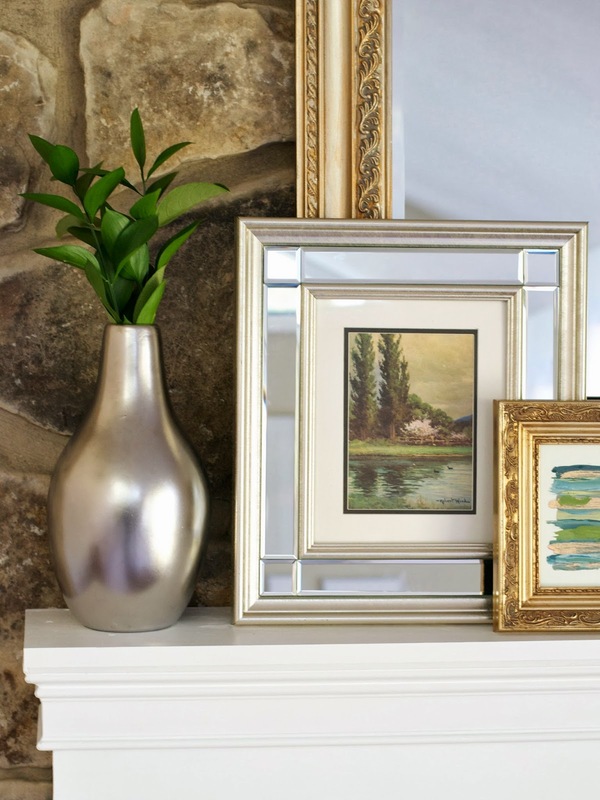 I originally planned to use the floral print on the mantel, but ended up using that small painting of the lake instead. I painted the little deer with my favorite gold spray paint I use on everything (affiliate link). And I paired him with a few mercury glass candlesticks I found at Marshall's. I put my thrift store painting in a mirrored frame I've been hoarding for awhile now, just waiting for the perfect victim. That poor little Bob Ross-esque painting never saw it coming. I added a pretty silver stoneware vase with a few stems cut from whatever plant the Kroger lady cut it from. And I also added a little handmade painting (similar to the large one I made here). It's the perfect fit for my little thrift store frame. 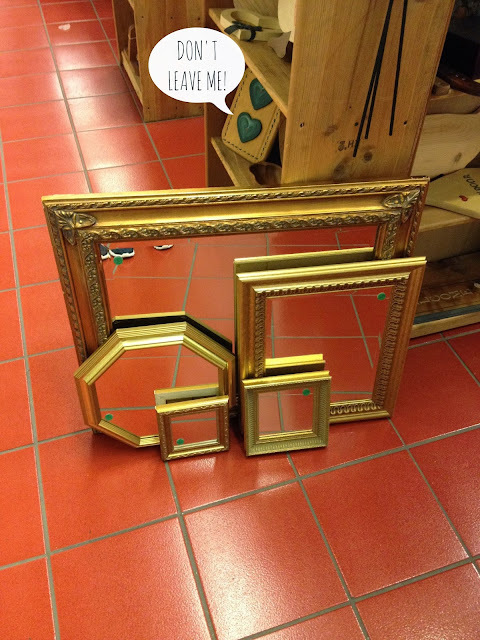 Oh, and remember a couple of weeks ago when I found all of the gold mirrors at the thrift store? Well, that big one ended up being the perfect size for the fireplace. However, it was a little too orange for my taste, (You can see what it originally look liked much better in this picture that I took when I was trying to figure out how to style the mantle). So, I painted it (using an awesome tip my new neighbor gave me that I'll share soon). So, now let's get back to the stacked logs and talk about how to do it. 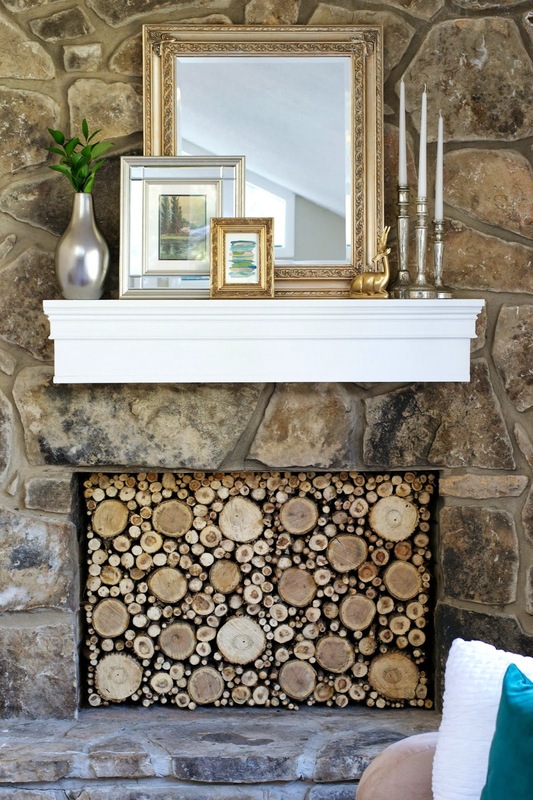 I've wanted to put stacked logs in our fireplace for years now, but always thought it seemed kinda impossible. 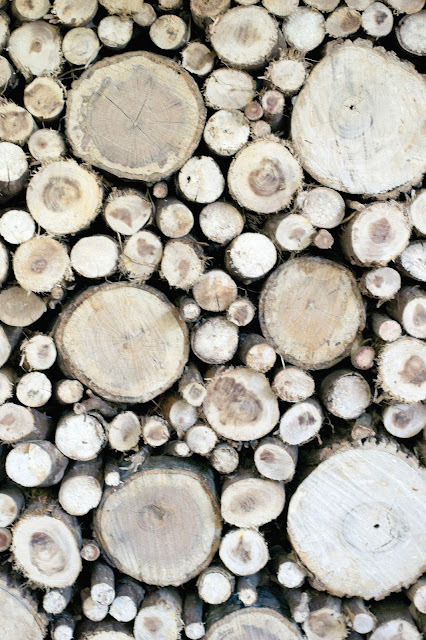 Basically, I saw pictures with 5 million perfectly stacked logs, drooled with longing for a minute, and then promptly ran the opposite way crying with inferiority. But then, I saw this gorgeous version a few months ago, and I realized that there was a much easier way to do this. Great news. Even us normal people can do this. That being said, I must keep it real, you should know that this took me forever. I wanted to quit 5 times. I got Liquid Nails in my hair....twice. Jesse wanted to move to Hawaii and never look back. 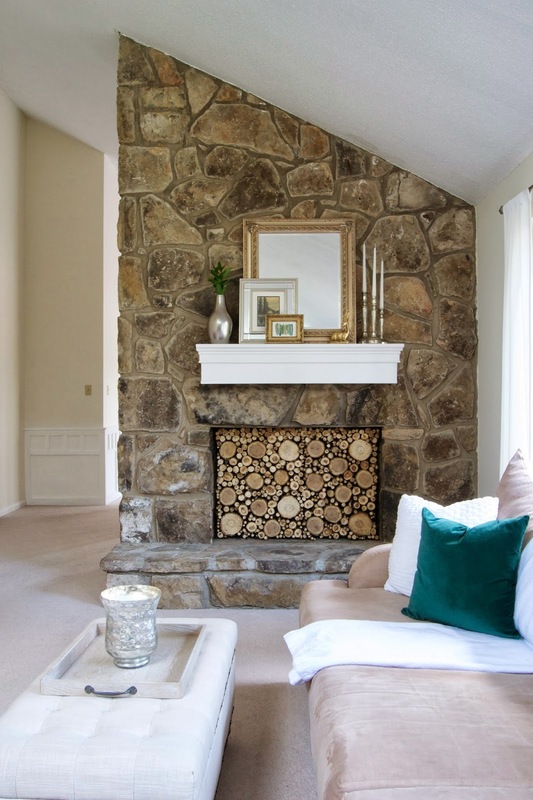 But, in the end, we're living happily ever after with an amazing faux fireplace. Basically, you're going to need a million more pieces of wood than you think you could every possibly need. At one point, I was Scrooge McDuck rolling around in my money pit of tiny logs, and then I used them all and still had 99% of my board to fill. Don't count your McDucks before they hatch. My logs were kinda a hot mess and all sorts of different colors. Bleach totally saved the day. 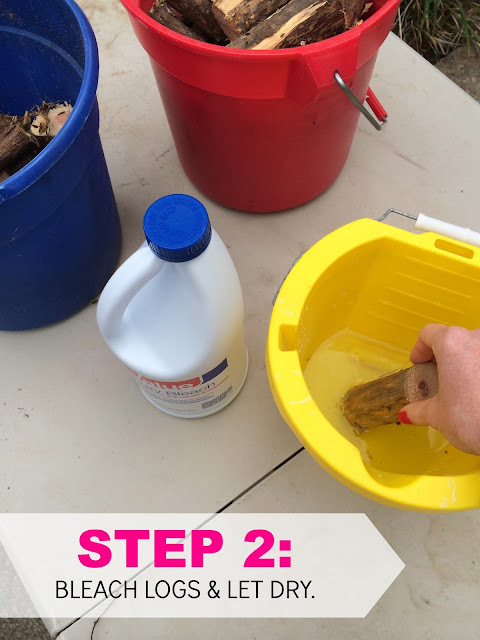 Just dip your logs in bleach and lay them out to dry in the sun for a few days. This lightens them up and makes them pretty and gets rid of any critters that are hiding out in your wood. 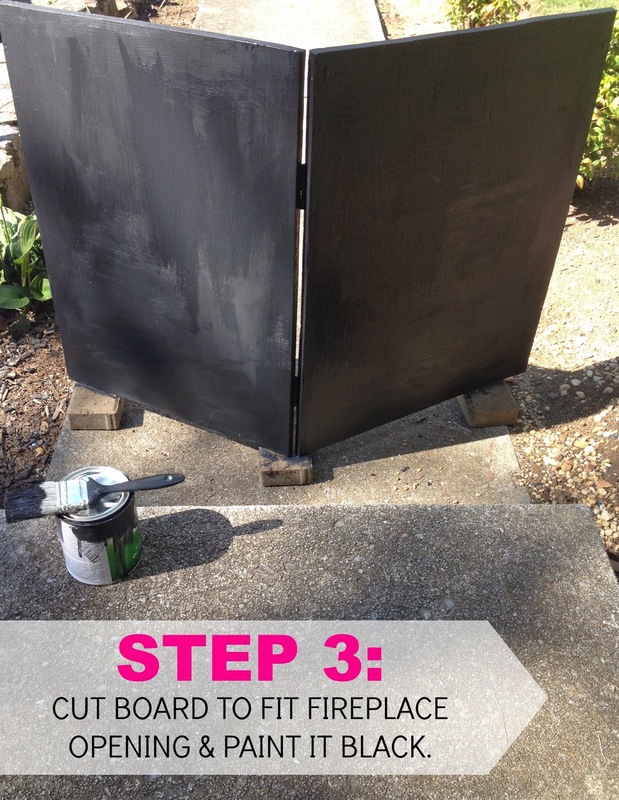 STEP #3: Paint board black. This was the gamechanger for me. It made this entire project feasible. Rather than stacking a million whole logs, you can cut little pieces and glue them to a board that is cut to fit the opening of your fireplace. We actually cut our board into two pieces and attached hinges in the middle since we had uneven stones on the edges of our fireplace that made it difficult to fit a board inside in one big piece. 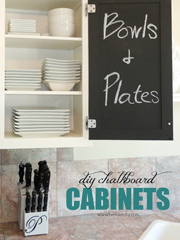 One the board was cut, I painted it black with chalkboard paint. I chose chalkboard paint since I had it on hand, and it's really dark and has a flat sheen. Basically, the black paint creates the illusion of shadows and makes it look like your log pieces are actually real logs, stacked deep within the fireplace. STEP #4: Nail larger logs to board. I placed about 20 larger logs around the board and had Jesse anchor them with nails. I chose to do a mix of big and small logs evenly spaced throughout the board. I attached my big logs with nails screws first, and then once those were all in place, I started filling in the gaps with the smaller logs. 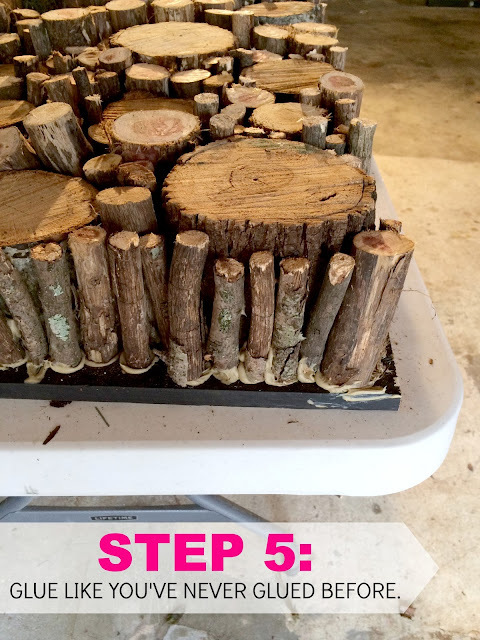 I attached all of the smaller logs with Liquid Nails (affiliate link) and it worked like a charm. Here is a view from the side of the board after I had glued a bunch of logs into place. You don't see any of the glue once the board is in place, so glue 'til your little heart's content. It's a really time intensive project, and although it isn't easy, it is do-able. And the best part is, between the mantle, stacked logs, and thrift store styling, I think this entire makeover cost me under $100. And that makes me feel like all of those late hours by myself in the spider garage with tubes of glue was totally worth it. Thanks so much for stopping by today, ya'll! The easiest way to make a pillow. Ever. What's happening on the other side of that 1970's rock wall. 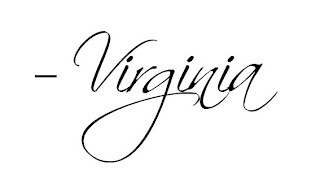 Virginia, the faux log stack is fabulous! Great job! Seriously Stunning! What a brilliant idea and SO cozy looking! Ohhh Mmmmm Geeeee!!! Get outta fireplace town…I mean - Call the Fire Marshalls- This Is off the Tree Tops!!! Girl! I am in LOVE!!!! Wowowowow like wowow. Busting out a dance for you…I love it! The spiders and glue were worth it. It's pretty stinking cool girl!! This is so charming! I have a question though. Is this a cover for a fireplace that doesn't work, isn't used, or simply a screen that opens when you want to use the fireplace? Thanks. INCREDIBLE. The logs, the mantel, the decor, I want to roll around in all of it. Its is amazing! Wish I had a fireplace to do the same! LOVE LOVE LOVE! Incredible and inspirational! I wish I had a 70s fireplace hanging around here now. WOW! What an amazing transformation. That mantel is fabulous, the mantel styling great and the stacked logs??? Fabulous!! love love love- it all looks glorious. and now it's got me thinking about making an entire faux fireplace in my bedroom so I can feel like I'm fancy enough to have a master bedroom with a fireplace. It is a labor intensive project but well worth it. I love ours (even a year later!!) Looks great. **Completely passed out from the gorgeousness. 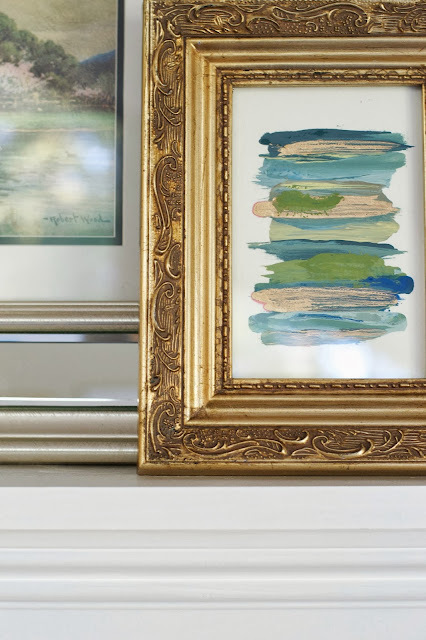 ** The mantel styling? You NAILED IT. NAILED. 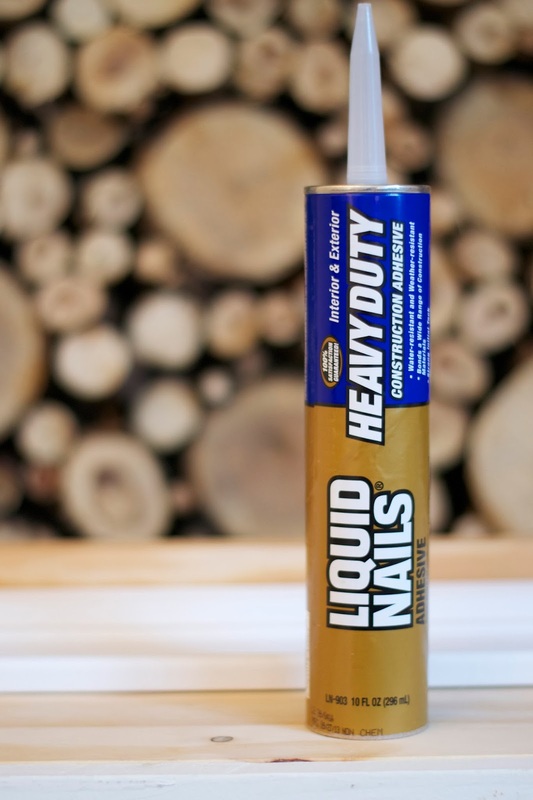 With liquid nails. 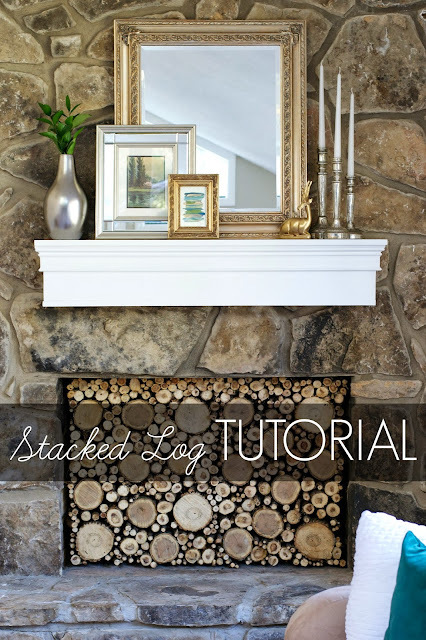 LOVING the stacked log situation AND the new mantel. High fives to both of you. Fan-freakin'-tastic. You did a very good job! I think your great attitude adds to the experience of making such tedious crafts. This is so gorgeous!! I've been creepin' on yo blog for a while now but this is my first comment..that's how amazing this project came out! 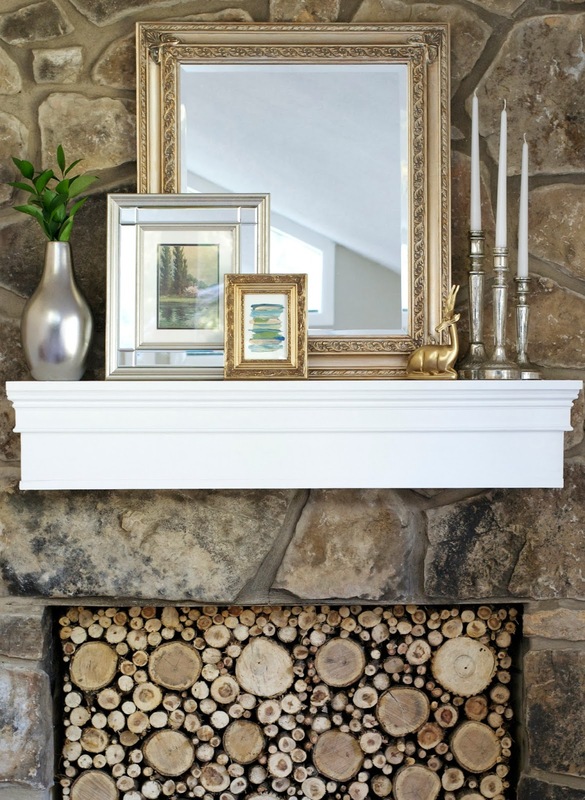 Not to take away from the stacked logs but girrrrrrrrrl your mantle is phenom. Quick question: what paint did you use on the mirror? I have one that I just got that is waaaaay too orange and needs to get toned down. Your mantle is fabulous! 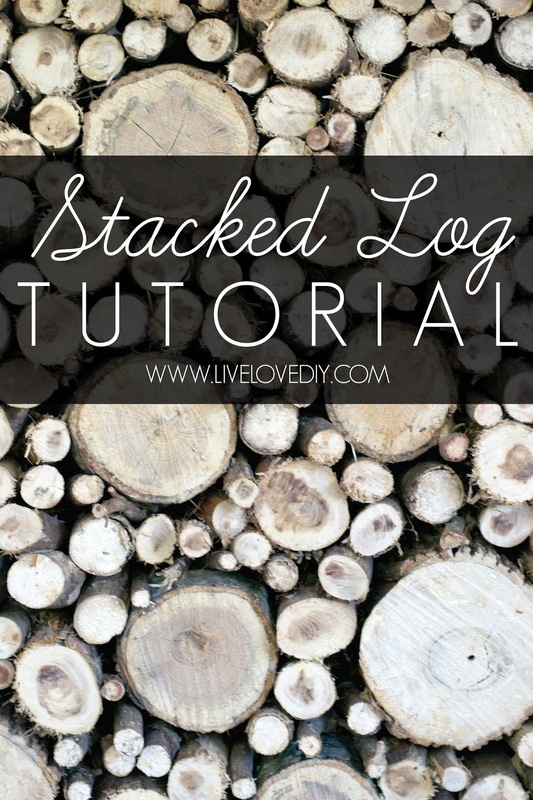 The stacked logs are soooo pretty and what an easy (sorry! I know you worked hard) way to do this rather than stacking a ton of wood. 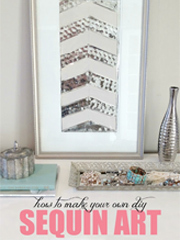 I just love the decor on your mantle...love mirrors! Just discovered your site and this was my first email. Wow! 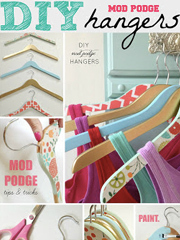 I'm so envious of all you amazing DIYselfers. I wish I had your patience and creative side. 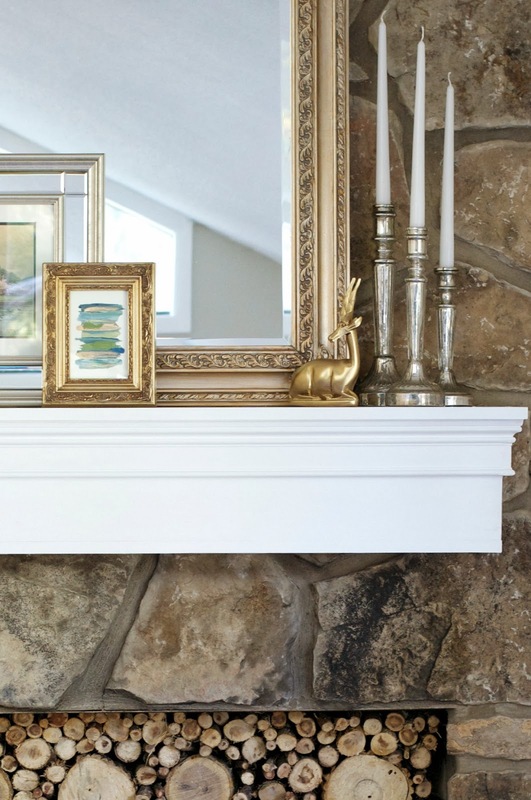 I'm in awe of anyone who can avoid purchasing a $400 mantle by making their own for a fraction. Your fireplace is stunning. Off to see more! Oh, I love this too! I've been drooling over all the stacked logs and I have a fireplace in my basement that I never use, I'm going to try this I think... now... where to find logs!! Love this! Awesome job on the mantle and the stacked log fireplace. 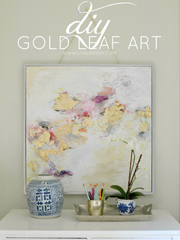 Its pretty, i really love how you style the mantel. Can you tell us when to sand when spray painting and when you leave the thing as is please? Im still trying to figure that out! 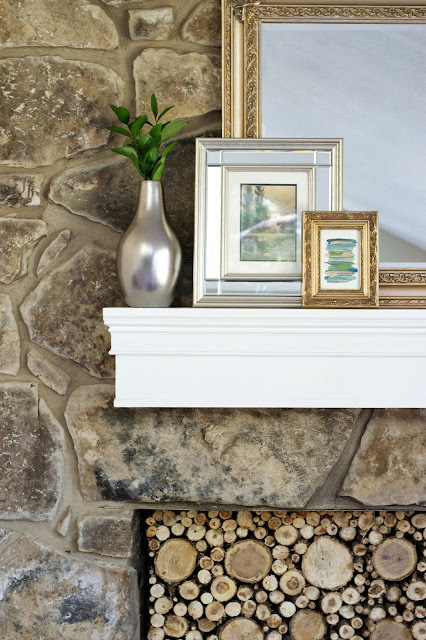 The mantel and the faux logs look fantastic! Wonderful! In a word: Fantabulous! ;) You guys did such a great job. It looks so classy. 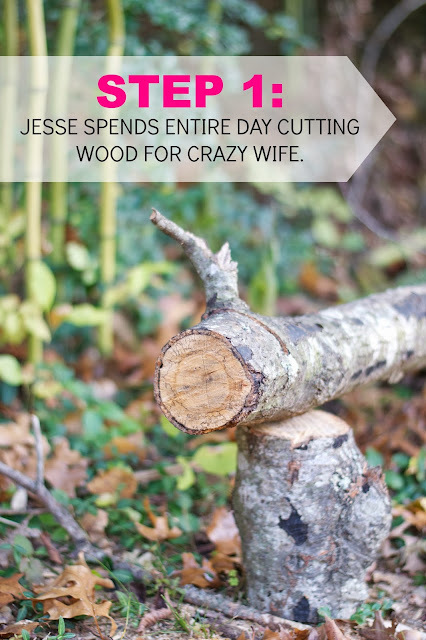 (I'm sure Jesse got a million Awesome Husband Points for all of that too.) 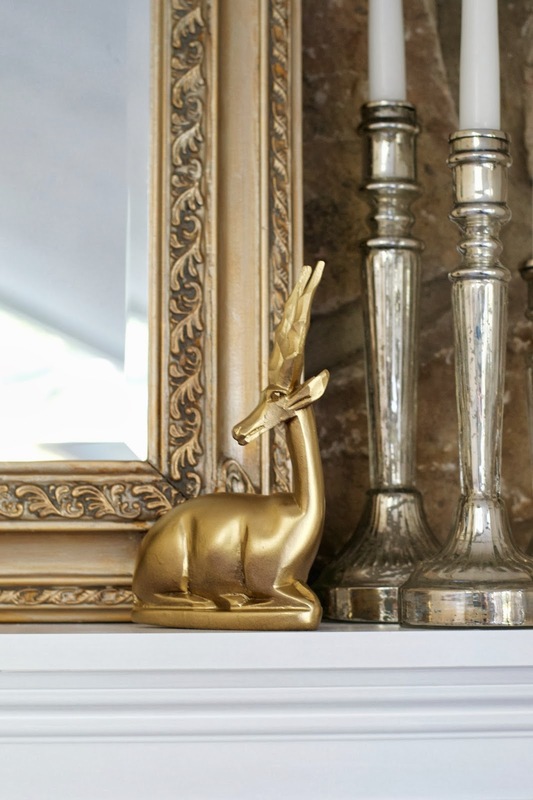 I really love the darling little deer and the mirror frame is perfect. Styling a mantle is FUN and trust me--you will want to re-do it fifty thousand more ways. I'm so glad you have one now, you are going to love it! Adore this. I have been obsessed with the stacked log look since last years Ikea log fabric. This is so cool! LOOKS GREAT! And I am also really impressed with how far you've come just decorating and taking photos of it. Good work! Please share the tip about making the mirror less orange gold! 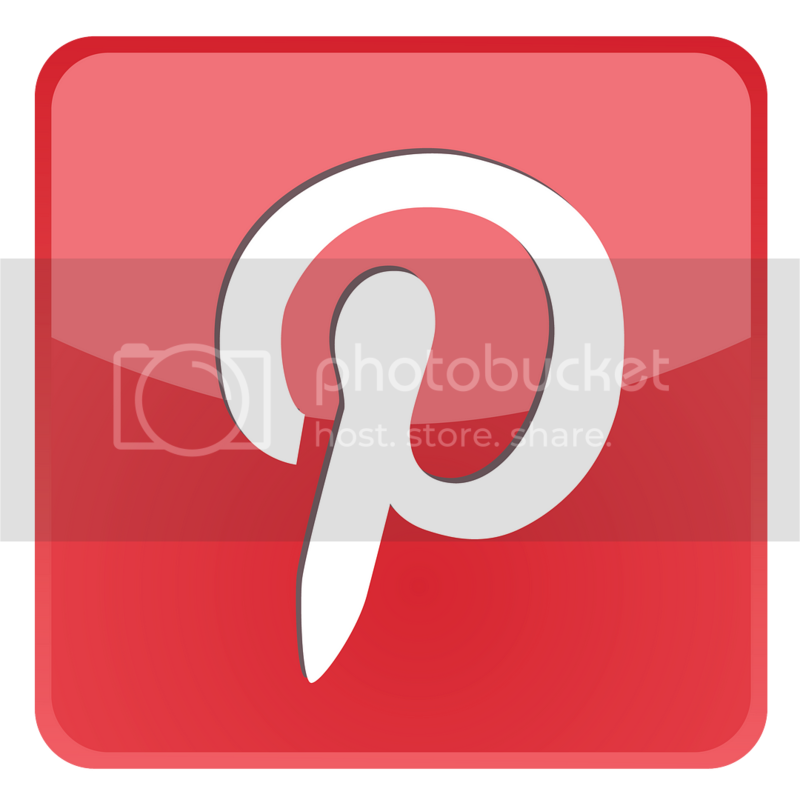 I just found your blog a couple of days ago while Googling how to paint trim. 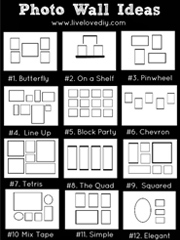 Before I knew it, I had 20 tabs open exploring just about every aspect of your site. I love what you do! You're young, thin, gorgeous and creative. I desperately wanted to just be jealous of you, but instead you're so frank, funny and positive that I am simply in awe. 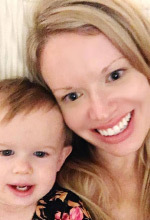 You've really worked magic in your house, and you give me hope that perhaps I can too. I'm so distractable that it's hard for me to stay focused on one project. (What started as simply peeling off some wallpaper in a bathroom has now become more of a, "Am I improving or simply destroying?" quandary with half-painted trim, half removed wallpaper, and a totally cluttered bathroom sink.) Reading your posts keeps me above water and dreaming of the finished project. Thank you so much for your blog. I just love it. This looks amazing! And I think we would be best friends. Haha but not in a stalker way. 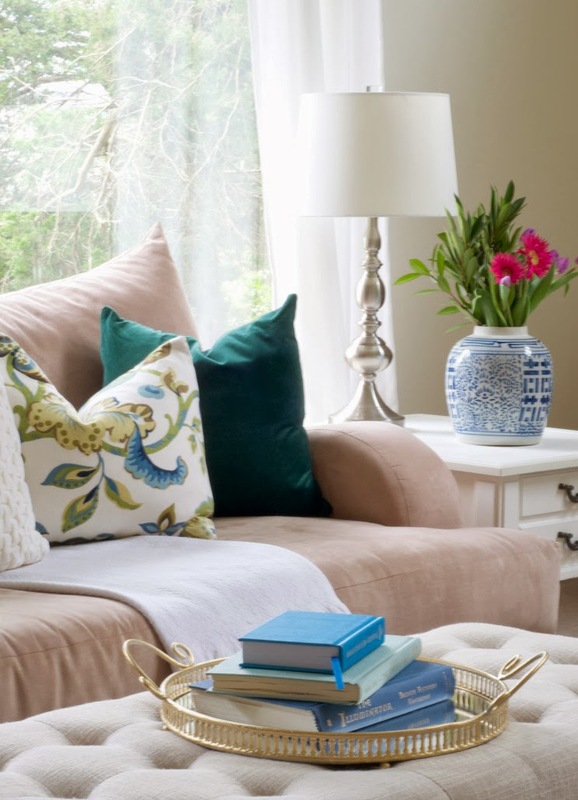 Great job on this most recent living room decor version! Love this! 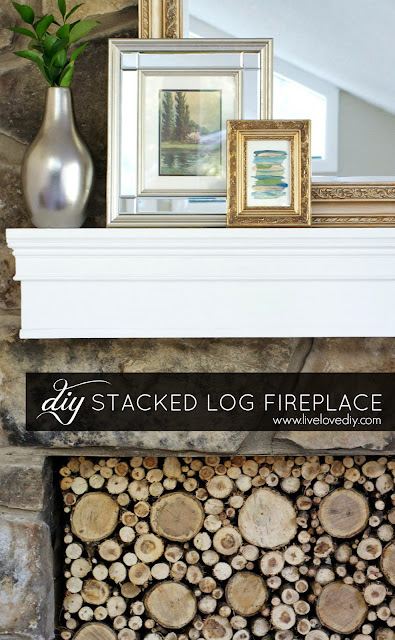 I've been wanting the look of stacked logs in our fireplace without having to actually stack a million logs in it. What size did you cut your log pieces? 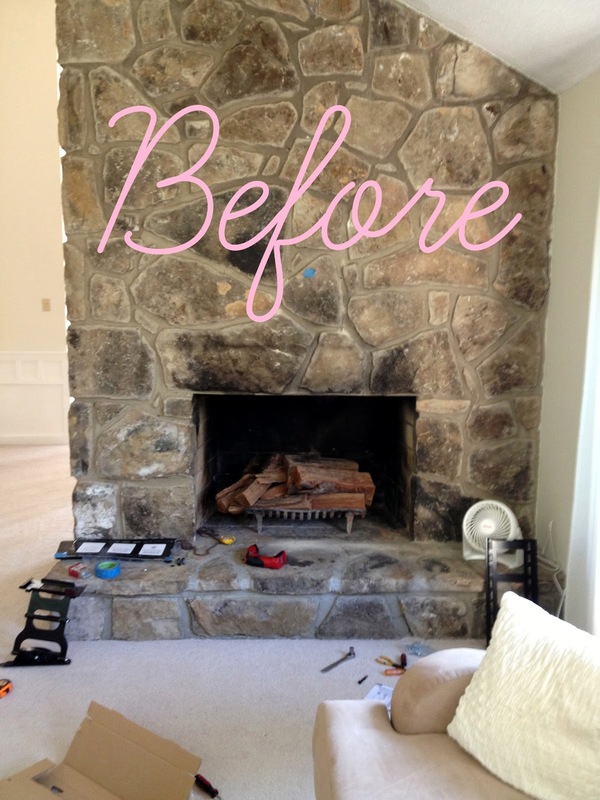 We will definitely be doing this in our fireplace in the very near future! At first I was all "meh" when I read this tutorial. But then I moved to a house with a never used fireplace. And my eyes were opened to the gloriousness that is the faux stacked wood fireplace. Thank you thank you! Good thing you know whats cool before I do! My chopped wood is ready to be glued as I type! So excited!! This is beautiful but I was hoping you would say it was easy-peasy. Darn!